Dienekes’ Anthropology Blog: Major new paper on Y-chromosome haplogroup J1-M267 by Tofanelli et al. Major new paper on Y-chromosome haplogroup J1-M267 by Tofanelli et al. The supplementary material are free online. Figure S1 is particularly interesting since it shows an inverse correlation between gene diversity and J1-M267 frequency in the studied populations. However, a wide range of times since the most recent common ancestor (TMRCAs) has been proposed for J1 and its subclades (between 36 and 10 KyBP), and different conflicting scenarios have been depicted to explain their current distribution. Unfortunately I wasn't able to locate in the paper/supp info any mention of the mutation rate assumed in this paper which leads the authors to come out in support of a pre-historical "hunter-gatherer" mode of dispersal for J1. Naturally I'm very skeptical of archaeological conclusions based on TMRCA, both because most of the literature leads to age overestimates, and because population movements may be both older and younger than TMRCAs, and TMRCAs of modern Y-chromosomes tell us virtually nothing about them. UPDATE (Apr 21): A reader alerts me of the fact that the mutation rate is shown in Supplementary Table 4, where a uniform distribution between the germline (0.0028) and "evolutionary" rate (0.00069) is assumed. As I don't think there is any merit to the evolutionary rate for large haplogroups, the ages presented in the paper should be divided by ~1.5, although as always, these carry fairly wide uncertainty margins. How can anyone attempt to trace J1 without such crucial data that may perfectly be at the core of the lineage? Figure S1 is particularly interesting since it shows an inverse correlation between gene diversity and J1-M267 frequency in the studied populations.Not sure what to make of this really. First, if we take only the Caucasian samples, the trend is obviously the inverse: with higher diversity clearly correlated with higher J1 levels. Second, most populations that show low diversity seem to be quasi-cousins, so to say: sampled in a single small town from the same commmunity. This is the case of Chechens, Iraqis (would be really shocking if Iraq as a whole would actually be less diverse than, say Portugal), Afghans (one single sample), Laks, Tabasarans. Surprisingly Kubachis and Tats (both high in J1) do not show such a low diversity in spite of suffering the same sample bias. The Sudanese sample comes from a major city (Khartoum) and comprises several Arab-speaking ethnicities, so here it may be true low diversity, due to recent founder effects. But high diversity samples like Iranians include at least two different communities (Persian Muslims and Zoroastrians) or, like Kurds, were taken in a major city (Kirkuk). Ethiopians are shown are very diverse and their sample is equally variegated, Central Italians appear rather diverse and come from many different towns, Tunisians are moderately diverse and again include a varied sample. In some cases (Qatar, Portugal...) the origin of the samples is not known. Some samples, like Omanis and Moroccans have been excluded from the figure - wonder why. So I don't really know what to do with that graph except to look at the Caucasus situaton (where all samples appear similarly "localist") and see the inverse correlation very much apparent. I am excited that the haplogroup I belong to is be being finally studied properly. Maju stated the exclusion of certain groups. The trouble has been that certain meta ethnicities have skewed data and results on J-M267 probably due to endogamy as in Bedouins or consanguineous matings, and emphasis on male lineages as in most of the Middle East but especially Yemenis. I am referring to the speakers of Arabic koine and ubiquitous Jews. I see that according to some of the spreadsheets that people like Vietnamese, Mongolians, Manchus have the haplogroup,and data has been used on various previously studied populations like Omani. Jordanians have been studies on there own right, remember the high R1b of Dead Sea Jordanians compared to other Jordanians. The Palestinians have been studied by the Israel scientists including Kurdish Jews and Muslims. No need to go over old ground. It was established in a previous study that European, Anatolian and Ethiopian J-M267 is more diversified than either North African or Middle Easterners. It has also been established that South Arabian J-M267 is of northern origin, so the Arabian theory of true Arabs and naturalised Arabs is back to front. Even the Arabic script is of Northern origin, and probably the language itself since the Nabataeans lived in the Palestine area of the Levant. Nothing new can be ascertained focusing too much on Arabic koine speakers or Jews. The TMCRA has faults but it has been worked out by competent geneticists, statisticians and the process undergoes peer review. No one rejected the assertions that men of hapogroup R1b were in Europe during Paleolithic times or that the Cro Magnons of France were of that haplogroup or that men of that haplogroup painted caves in Spain and France or that men of that haplogroup were responsible for various Paleolithic cultures. Now is not the time to query TMCRA just because J-M267 is proving to be older than R1b, possibly in Europe long before the common haplogroups now in Europe, and it has nothing at all to do with non European Semites in origin. I said all this to you many times in the past. I am glad you are convinced about this now: European J1 (and more J2) "has nothing at all to do with non European Semites in origin". Some people here need to wake up, do you think J1 elites (The Semites thats is), want to be associated with you? Whats with all the rude/jealous talk about Semites purity, we are pure J1 because we didn't allow other people to move into our lands, For now try to mix with some Norse or Dinkas maybe you can get tall enough to reach the sour grapes Mr Hunter gatherer! Whats with all the rude/jealous talk about Semites purity, we are pure J1 because we didn't allow other people to move into our lands...That's an ethnic fantasy you have. Obviously a lot of people have migrated along the ages to the historically Semitic lands of West Asia (but of course they have been absorbed by the local majorities). Some went as conquerors, others as slaves and others as traders, pilgrims or whatever. But people moves and such a busy crossroads as West Asia has been destination for many along the ages. Of course this can be applied to nearly every other place to some extent at least. There are no pure peoples, just fantasies of purity. I think the issue is anyhow where did J1 originated and when moved to this or that place. For example it is easy to imagine that it arrived to Sudan only recently, with the Arab conquest but what about Yemen? Or Daghestan? Is it originary from Palestine as I suspect or has some other origin? What's the timeline of J1 expansion: Paleolithic, Neolithic, especifically Semitic (almost historical), all of them? It is an interesting subject and should not be taken as offense to research and discuss it. "Whats with all the rude/jealous talk about Semites purity, we are pure J1 because we didn't allow other people to move into our lands,"
Pure? That is the most obnoxious thing I have read in several days. As for moving: you see in "your lands" people with blue eyes, green eyes, incredibly dark skin and everything else in between. I haven't seen people who look Eastern Asian from there, but almost anything else yes. Inbreeding is not good, man. Chill off. As for moving: you see in "your lands" people with blue eyes, green eyes, incredibly dark skin and everything else in between. I haven't seen people who look Eastern Asian from there, but almost anything else yes.But that doesn't mean admixture either. Those traits are IMO deeply old. Blond does not mean Nordic, even if Nordics have more apportion of blonds than other populations. Founder effect and adaptative advantage... but the original stock is the one of West Asia. Maju, obviously there were different waves in which blue eyes and the liked arrived to Lebanon, Syria, etc, but they did not appeared everywhere, they came from somewhere and that some was very probably not any area from the J1 regions. pregnant. Possibly there was also flow through Slavic slaves being imported to Syria, Arabia, etc, through the centuries. OT, I have a couple of questions on Basques. Do you have an email where I could ask them? Whats with all the rude/jealous talk about Semites purity, we are pure J1 because we didn't allow other people to move into our landsThen can you explain to me how come the northern Semites are genetically closer to their non-Semitic neighbors (Turks, Kurds, Armenians, Iranians, etc.) than to the southern Semites? @Kepler: some OCA2 haplotype may had a single common ancestor but this is different from the media hype. See: SNPedia: eye color. 10% of blue eyes are not descendant from that apparent single mutating ancestor, who anyhow may have lived in Kurdistan for what we know. Anyhow when I talk of blondisms I first of all think in blond hair, so common in Oceania, what suggests a very deep pan-Eurasian ancestry. Blondisms are widespread (at different frequencies) by all West Eurasia and North Africa (and in some aspects also among Oceanian natives - and I have seen SE Asians too with blond/light brown hair). It is not any tag of "made in Sweden", not at all, the same that black curled/wavy hair is not any clear sign of Mediterranean origins by itself. The Blues eyes are there because of the 30% H mtDNA in the region.It might be correlated but I rather doubt it. Blue and green eyes depend on other genes that distribute themselves in a rather independent manner from haplogroups. Anyhow, as I said before the person originally mutating to that imperfect form of albinism that are blue eyes, could perfectly had lived in Kurdistan or weherever. They are certainly way too frequent everywhere to be a recent Viking founder effect. Slave trade brought to the region blue eyed Slavic girls.True (and don't forget the Malmlusk, etc.) But you can't explain that way the prevalence of blondisms in general, especially in marginal distant areas like Morocco. It's just older, surely older than the colonization of Europe or at least older than Gravettian. More density does not mean ultimate origin but founder effect (or selection - would be associated to light/darker skin, as themelves are neutral). However, The younger more advanced progressive downstream lineages of J1 are SemiticLOL, I love how that sounds. But makes no sense. Anyhow, Palestine is North of Yemen. What Ponto meant by northern, I think, is the Fertile Crescent: northern with respect to Arabia peninsula. Palestine is a likely ultimate origin of J1 in fact (would fit much better than the Caucasus). OK, some blue-eyes in Morocco or Algeria, Libya or Egypt, Palestine or Syria may be due to some non-European origin, but most of them are more likely to be from Caucasian, definitely non-Semite origin. It is a fact Europeans and others (to a lesser extend others) were invading, living and sleeping around in those regions for many thousands of years. I am mostly reacting to Abu's statement on pure Semites. There is nothing purer on them than on most other populations, unless he means some wee villages in the middle of Yemen. Also I don't think that "Romans, Greeks, etc." were much blonder than West Asians. I know blonds were also a minority there (let's recall Romans used to buy massively blond wigs from Germanic tribes), the same with blue eyes, but then they were much more frequent than in Morocco or Palestine. I believe it is safe to say most of those you see in those regions with blue eyes are basically product of some Roman soldier/Greek mercenary or of some people who went Southwards during Neolithic times and definitely not a "pure Semitic type". OK, some blue-eyes in Morocco or Algeria, Libya or Egypt, Palestine or Syria may be due to some non-European origin, but most of them are more likely to be from Caucasian, definitely non-Semite origin.Erm... If by "Caucasian" you mean Caucasoid (Caucasian actually means from the Caucasus region: Chechens, Armenians and the like), that is the same as West Eurasian (somtimes it also includes most Indians and Ethiopians but that's arguable maybe). West Asians and North Africans are definitively Caucasoid in any case. Also the bulk of North African ancestry (and I'd dare say West Asian too) is not Semitic. North Africa has only been semitized recently: they used to be other ethnic groups historically and in fact many of them still are. Anyhow, shave Saddam Hussein's moustache and get him in, say, London: would you notice anything odd about him? Not at all. The way you categorize seems to me full of misconceptions. It is a fact Europeans and others (to a lesser extend others) were invading, living and sleeping around in those regions for many thousands of years.And vice versa. European dominantion of the area anyhow was mostly a Greek, or rather Hellenistic, issue, even under Roman banners. Greeks are not that distinct from West Asians in fact, so I doubt you can make an argumentation on that. 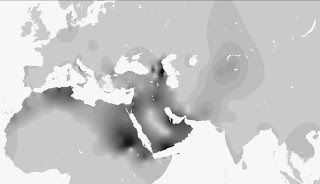 Would I look for European-specific influences in West Asia and North Africa, I'd look for Gravettian offshots, who may have been rather important back in their time (Zarzian recolonized the Zagros area after an LGM depopulation apparently, North African Oranian very likely had an Iberian origin at its genesis - both would Gravettian derived, Gravetto-Solutrean in the Iberomaurusian case). I am mostly reacting to Abu's statement on pure Semites.I also criticised that vision. but then they were much more frequent than in Morocco or Palestine. I believe it is safe to say most of those you see in those regions with blue eyes are basically product of some Roman soldier/Greek mercenary or of some people who went Southwards during Neolithic times and definitely not a "pure Semitic type". As I said before, while not excluding the occasional flow in Roman times, I am of the impression that European genetic (and therefore phenotypic) influences in those areas are mostly Paleolithic or Epipaleolithic. When we read that Tunisian mtDNA H is a subset of Iberian (not Italian!) mtDNA H I can only think of Oranian, unless Phoenicians recolonized the whole area with Iberians, at least Iberian women - what doesn't make much sense to me, especially as H (mostly H1 and H3) is like 25-33% of North African mtDNA (and not just in Tunisia). North Africans, Arabized or not, are anyhow mostly of Berber stock, not Semitic or otherwise West Asian. I know you're curious about your J1 ancestry, and are an Australian, however in your case there may be a very simple answer, namely that the British imported camels and camel drivers to the desert regions of Australia! Afghans provided almost all goods and services from South Australia to the Northern Territory. On a regular basis they left Marree, and later when the railhead was at Oodnadatta, with their camel teams for Stuart, later renamed Alice Springs. Some of the well known Afghans among them were Hector Mahomet, Peer Mahomet and Charlie Sadadeen. In 1933 Ernestine Hill wrote, 'Within the high tin walls of the Afghan camps in all towns of the north line, white women are living, the only ones in Australia who have blended to any extent with the alien in our midst. Renouncing the association of the women of their own race, they have forsaken their own religion for the teachings of the Prophet and the life of the cities for the desert trail. Several of these have made the pilgrimage to Mecca'.Basically these foreign camel drivers married British women and blended into the population - especially in Alice Springs, which I believe you are from?! pc, wrong again mate. I am British by birth, EU passport and all. Interesting for a foreigner that you know something about Australian history but like most foreigners, not much. Australians were British up until 1949 when the Australian nationality was created by the Australian parliament. As for the importation of "Afghans", most of those men were Muslims from North India, and Pakistan, some may have been from Afghanistan. They married extensively into the Aboriginal community around the Alice Springs. There are still descendants of the "Afghans" here, mostly brown skinned Aborigines. I commend your efforts to try to know something about Australian history but you need to study more as you are quite ignorant. Abu, Semitic is a biblical reference to an man, descendants of Shem, and it is a reference to a language group. Sorry, the Semitic languages are not that old and originated like all the Afro-Asiatic family in Africa about 10 kya at most. J-M267 and its downstream markers are older than any Arabians or Jews. In fact Ethiopian J-M267 is older than any Arabian J1, and even Europeans like me have more diverse J1 than Arabians. Think again, sport. I know quite a bit about Australia, as my uncle - a world renowned civil engineer - designed most of the largest bridge/overpass highway systems in Sydney in the late 1960's. Another uncle emigrated there in the 1950's and today manufactures one of the country's leading industrial air-conditioning systems, and now owns a million acres of outback, somewhere around the Murray-Darling basin... so I grew up hearing a lot about Australia. I even had completed my visa application to emigrate there myself in the the late 1980's, before deciding on the US instead, as I didn't fancy being called a "Whinging Pom" by the locals. BTW, I grew up on the Laois/Kilkenny border in Ireland. Irishman James Fintan Lalor from Laois, was famous for organizing the miners of Ballarat. Also outlaw Ned Kelly's Mom was a Cody from Kilkenny, and he was first cousin of Buffalo Bill Cody - most Aussies don't know that! Ethnicity is a cultural construct rather than a genetic one - just like race or religion. Very interesting paper regarding especially the occurence of J1 Haplogroup in southern poland. The polish gentiles derive their origin to the sarmatians which in turn derive their origin to Noah. Somewhere in the region of southern poland, slovakia and chechia was the medieval state of crobatia. Crobatia was founded by avarian tatars that came from central asia, namely choresmia. Choresmia was founded by hurrites from northern mesopotamia (http://www.imninalu.net/Eurasia_maps.htm). So it seems logically that in the region of today slovakia, chechia and souther poland there is a hot spot of J1. Fascinating. This genetic map in which the territory of Daghestan is shown as territory with lot J1 not corresponds to the validity. Daghestanians and Chechens as a rule light, than Armenians, Georgians and Azerbaijanians. For all Daghestanians so called "caucasian" Armenians, Azerbaijanians, the most part of Iranians are black peoples. Daghestan has appeared on this map owing to Turkic provocation. Such data are presented only at one turk from Bashkiria (Bashkortostan) which has made it to please to the Dagestan turkik speaking Kumyks. Besides in its research it is not specified, at whom it is concrete in Daghestan these data are taken. In what it is concrete village it carried out these researches. And it is more at one researcher of such data is not present. Its surname if I am not mistaken, - Yunusbayev. It is panturkist. If to look all other researches, including spent after Yunusbayev there such high parameters of a "Semitic" gene are not present. To Any word of Turks to trust it is impossible. And languages of Daghestanians/Chechenians have no the slightest relationship with Semitic. There are only separate loans.